We commend Alyssa Mehlhorn, for her work as a volunteer for the Sudden Cardiac Arrest Foundation, and in particular, for organizing a heart screening for fellow students as her senior high school project. Alyssa Mehlhorn couldn’t decide on a topic for her senior research paper. She wanted to focus on a debate in the medical community and wasn’t having much luck, until her grandmother, a volunteer for The Max Schewitz Foundation, suggested Sudden Cardiac Death in teens. The high school senior began to research the topic and quickly learned EKG testing for high school students was definitely a debate. A dedicated nurse for more than 40 years, Alison Ellison will retire this fall after decades of wholeheartedly caring for patients, advocating preventive care and educating healthcare providers. We are deeply grateful for her service and would like to take a moment to thank Alison for her invaluable role within the 2004-2013 “life” of Project SAVE. On TV it always seems clear and simple. A patient in the hospital goes into cardiac arrest and the medical team springs into action. After a few tense moments of furious activity, and only after all seems lost, the patient is successfully revived. A few scenes later the smiling and now fully healthy patient thanks the doctor and returns to his or her life as a professional athlete, parent of young children, or criminal mastermind. Medical professionals know that in real life this is rarely the way it goes. Most patients who undergo cardiopulmonary resuscitation (CPR) are old, frail, and very sick. Many will die and many who survive CPR will die anyway before leaving the hospital. And many survivors will have severe neurological problems. Sudden cardiac arrest -- when, without warning, the heart instantly stops beating -- kills 350,000 Americans of various ages and occupations a year, according to the American Heart Association. Yet now, with high school sports teams in intensive training for their fall seasons, now is when we are most aware of these fatalities because of a tragic drama: A young athlete in peak condition, who has never flunked a physical or shown the faintest symptom of cardiac problems, suddenly collapses. Death is usually all but instantaneous -- but it is not necessarily inevitable, not if a device called an automated external defibrillator, or AED, and someone willing to use it are close at hand. Sudden cardiac arrest is not the same as a heart attack, which usually is caused by blocked arteries and often gives some advance warning. Sudden cardiac arrest occurs when the electrical impulses that control the heart suddenly misfire. Thankfully, the number of deaths among volunteer firefighters in the U.S. has declined to a record low--27 such deaths in 2012. During the same time period, the overall incidence of sudden cardiac death in the U.S. was about 324,000 (359,400 x 90 percent survival). So, the number of people dying from sudden cardiac arrest every hour in the U.S. (~37) is roughly equivalent to the number of volunteer firefighters who die each year from SCA (27). Maybe we ought to be applying what is working for volunteer firefighters to the general public. The FDA has invited public commentary regarding its proposal to reclassify automated external defibrillators (AEDs) as high-risk class III medical devices. The deadline for submitting comments is today, June 24, 11:59 ET. Will Voices Crying in the Wilderness Be Heard? 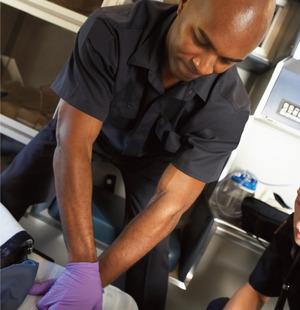 EMS Professionals: Join the Sudden Cardiac Arrest Network Today! In his FY 2014 budget submitted to Congress on April 10th, President Obama zeroed out funding for the Health Resources and Services Administration’s (HRSA) Rural and Community Access to Emergency Devices Program—the AED Program. Now it is up to Congress to restore funding for this life-saving program, as they have done in the past, but they need to hear from as many of their constituents as possible on the value of this program. The American Heart Association's Ad Hoc Coalition To Save Lives Through Public Access to Defibrillation urges you to contact your legislators and ask that funding be restored. The Sudden Cardiac Arrest Foundation is a member of the Coalition. Automated External Defibrillators (AED) are those breadbox-sized white boxes adorned with a bright red heart and lightning bolt seen in restaurants, bars, shopping malls and hotels across the country. They contain a lifesaving medical device designed to shock failing hearts back to life. AEDs are based on relatively simple technology designed for use by laypeople to analyze heart rhythms and determine whether or not a shock is required. Sadly, when Florida high school soccer player Abel Limones, Jr. collapsed during an intramural match, his coaches, players, principal and even school nurse ignored an available AED that sat idly by on a nearby golf cart as CPR was performed. Eventually, 911 was called. The child went nearly 23 minutes without resuscitation. By the time Fire Rescue arrived, the boy was left with catastrophic brain damage. Today, he lives in a constant vegetative state requiring 24-hour care.